I’ve spent a significant amount of the last months pushing out of my comfort zone, which has proven to be both empowering and rewarding. I am regularly taking inventory within my existing feelings of discomfort, trying to distinguish what is ignorance and what are acceptable personal limits. Honestly, it’s never really been clear. I try to have an awareness of these reactions though and to explore ways to dip my toes into an uncomfortable place if it seems safe and like it would lead to a more culturally rich experience. I had heard from many people who had been to Southeast Asia that Cambodia was the #1 destination to see. I heard about its beautiful beaches, amazing temples of Angkor Archeological Park, and lovely people. However, when I finally started thinking about visiting, I had to question some obvious implications which didn’t typically come up in these raving reviews about the country. What is it like to be in a country with such a violent history? What are the lasting effects of the war? How do you talk about the history, if at all? I admittedly didn’t have a great understanding of the Khmer Rouge and was happy when I made the plan to visit with my sister, Lindsey, and her fiance, Jake, because I was nervous to go on my own. Cambodia was difficult – by far the hardest time I’ve had in any destination on my trip. In order to explain why, I have to reference its history which is, in my opinion, a bit confusing and I am certainly no history buff, so bear with me. Also please beware: there is some graphic content in this blog post. I decided to share it purely to illustrate the scope of what happened there, which I don’t think many people will have the opportunity to see first hand and I think it’s important to understand. Also, a note: I didn’t take any pictures of the killing fields and only a few at S-21 prison camp, as it didn’t feel right to me (others took photos, but it was a personal choice not to), so I apologize for the lack of visuals but I think the reasoning for it will become clear as you read. The history of Cambodia is extremely complex and still highly controversial. Here’s my best attempt at keeping it short for the purposes of this post. After a coup to overthrow Khmer King, Norodom Sihanouk (another controversial leader), and the destabilization of the Cambodian government from the Vietnam War, Pol Pot and his organized army, the Khmer Rouge, rose to power with backing of a growing number of Cambodians and the North Vietnamese. Pol Pot believed in an agrarian communist utopia, inspired by Mao Zedong, where everyone would be equal and tied to the land. He believed that education, religion, urban life, and other institutions were all evil. “Every city in Cambodia was forcibly evacuated. Two million people in Phnom Penh had to leave the city on foot for the countryside at gunpoint. It is estimated that around 20,000 died along the way. Millions of Cambodian city dwellers were now forced into manual slave work in rural areas. Since they were only fed a tin of rice (180 grams) every two days, they quickly began to die from disease, being overworked and undernourished.” The Central Committee began taking the people they found most evil (i.e the most educated, famous, or entrepreneurial types) and killing them, along with their entire families (all generations, including infants) to avoid having any sort of trail of revenge taken later on. Pol Pot’s paranoia increased as his reign went on and what started out as killing a few hundred people every week increased to be thousands each day. It’s also important to note that Pol Pot himself was educated in Vietnam, on the very concepts which he then used to terrorize the Cambodian people, and he would have been labeled as “evil” under his own power had he not been leading the movement. There are “killing fields” located throughout the country, which were literally just places these so-called evil people were taken to be killed. The most chilling example of this, was the mass grave found with remains of mothers and babies. A large tree next to the grave was used to kill the babies by holding their feet and slamming their heads against the tree’s trunk. Once this killing field was discovered, so were the remains of baby’s brains on this tree, which is now covered with visitors’ colorful bracelets as a tribute. 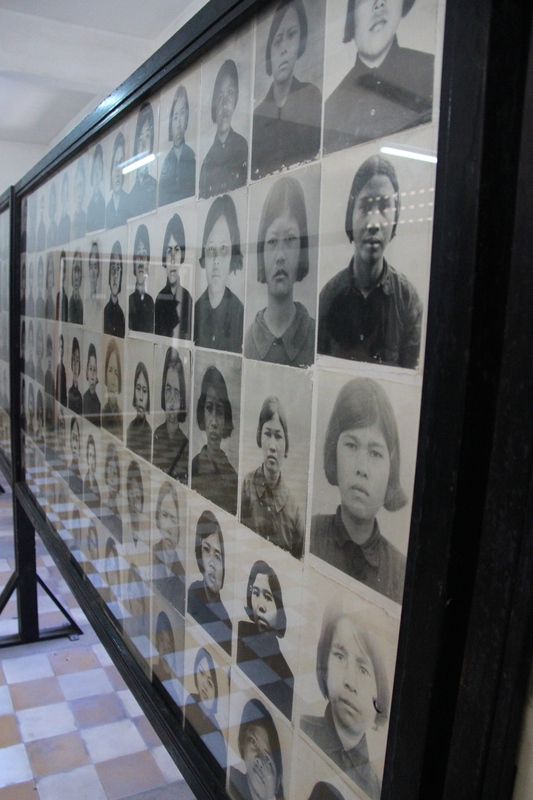 Overall, the Khmer Rouge killed over 2 million out of the 8 million Cambodians in existence. Pol Pot’s group did this in under five years. And while that is absolutely devastating and terrible, I think it’s equally important to realize that he killed all of the people in the entire country who had the ability or education level to make an impact. Cambodia was left only with it’s self-contained farmers, who had no knowledge of restarting the economy or rebuilding the basic and absolutely necessary social institutions like hospitals, schools, and banks. 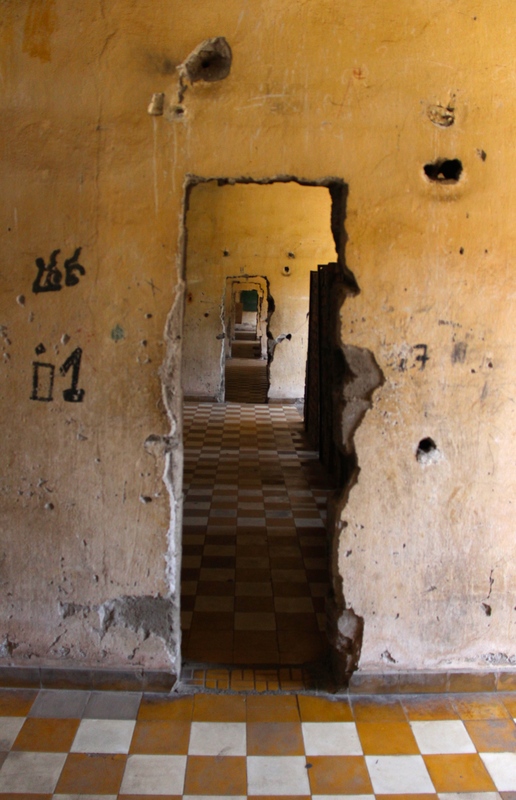 One of the most alarming realizations I had during my time in Cambodia was that this wasn’t all that long ago – they are entering the 35th anniversary of the Khmer Rouge reign. It’s hard to understand how this could happen in the modern world and why it wasn’t stopped sooner. However, the country was in a state of such chaos, which was intentional on Pol Pot’s part. Because the modern aspects of the society were being ruined – hospitals and schools were burned down, any sort of electronic or TV would have certainly been destroyed – there was no way to understand internally what was going on or to gain momentum with some sort of backlash. On one day in Angkor Archeological Park, we hired a Cambodian tour guide to take us around by tuk-tuk. 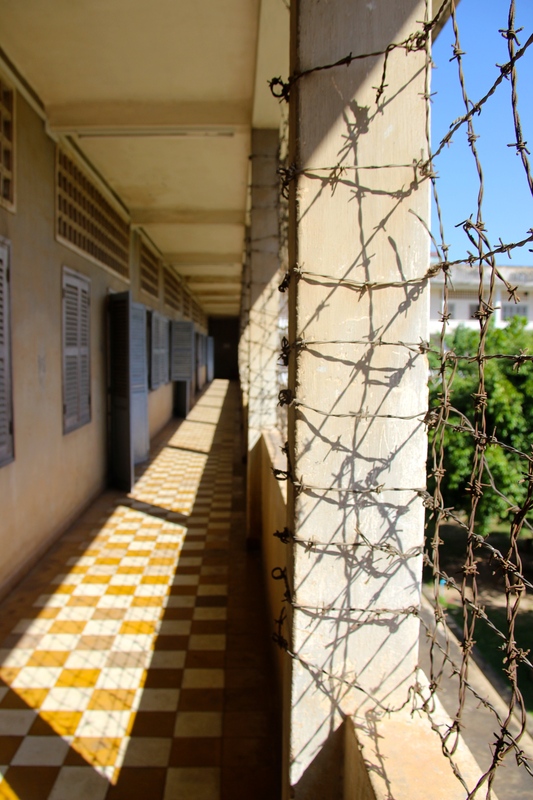 We had spent the previous day in Phnom Penh, visiting the S-21 prison camp (a former school used to hold and torture prisoners of the Khmer Rouge) and then the killing fields (with over 20,000 killed at this one location). We were still feeling raw from the things we saw and history we heard. We initially tiptoed around the subject, but eventually outright asked our guide about his own story. He was born in 1978 – well into when things started getting violent and, because his family was separated and it was unknown if any of them survived, he was brought to an orphanage, then raised with other orphans in a monastery. He also gave us some context we never would have heard from an audio guide, which brings it all home for me. It is widely believed that Pol Pot’s education came from North Vietnamese people, with plenty of Russian influence. Therefore Cambodians feel that Vietnam was intentionally weakening Cambodia to then be able to take over power. At this point, according to our guide, the most successful business people in Cambodia are either Vietnamese or Chinese, sometimes even pretending to be Cambodian. So that means the most successful businesses within Cambodia are still pumping money out of the country. The currency is completely unstable, therefore the majority of people use US dollars. Jobs are scarce and the ones that do exist are increasingly reliant on tourism. I saw the worst poverty I’ve ever witnessed while in Cambodia. People lived in tin shacks with three sides, no floors, and an open side out to the street, doubling as a store front. Often you’d see over-the-top ritzy resorts right next door to the slums. It wasn’t rare to see children standing in a line, singing songs asking for money in the cutest way possible. We witnessed a huge amount of people walking around urban areas without shoes. We passed thousands of people stuffed onto the back of flatbed trucks, going home from a day at the factory. So much of it stopped us in our tracks. 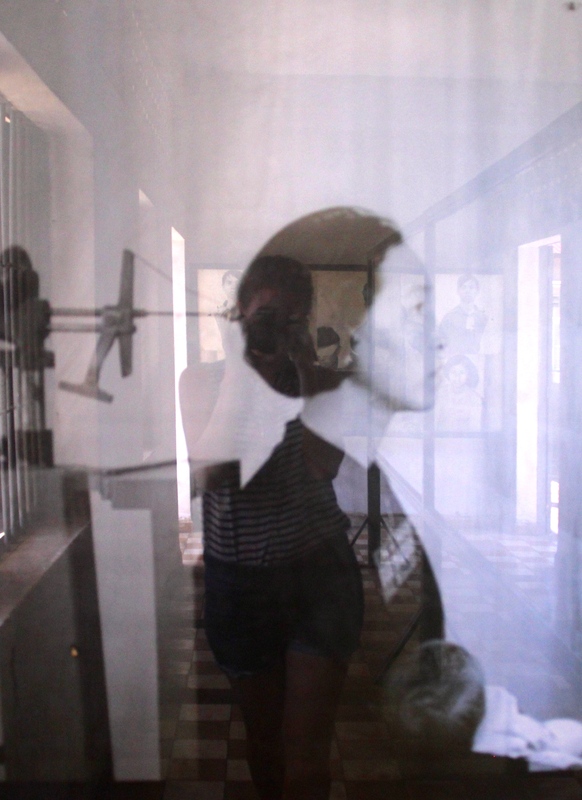 We either felt guilty or swindled the whole time we were there – none of it felt authentic. We had a fantastic dinner in Phnom Penh but it was the kind of meal I’d expect to get in New York City, not Cambodia. Hotels had lavish Western breakfast buffets with mountains of food, which only made me wonder how much the employees must resent its customers who were able to live in such excess. Christmas trees and holiday music were everywhere, which irked Jake (hoping to avoid the holiday craze during his time in Asia), and was emblematic of how Cambodian culture had been overshadowed during our visit. All this was quite extreme, especially given the way I am used to traveling. 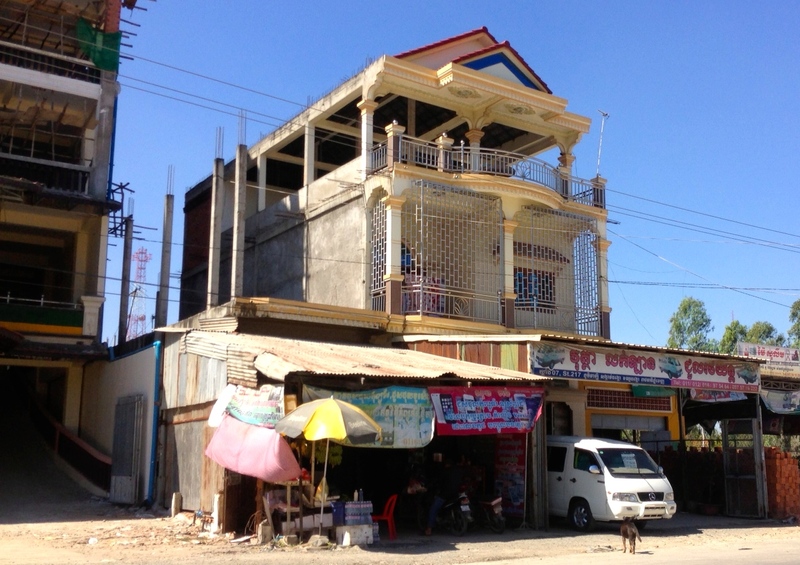 I suspect that the hostels and well-worn backpacker trail in Cambodia might strike a better balance than we were able to find. However, this was our experience. 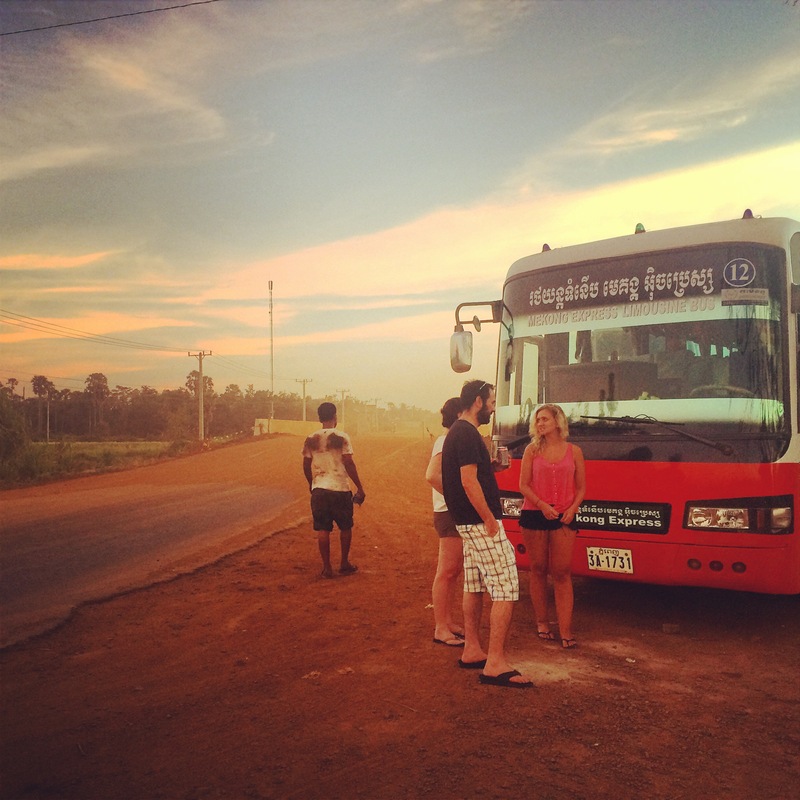 Travel in Cambodia is primarily by bus, particularly on Mekong Express. It seems to be pretty much the only way to get anywhere. We had some epic travel days, including one trip with unpaved, ditch-filled roads for several hours and a two hour flat tire break. I was thankful to be introduced to the uber-popular American podcast “Serial,” which I started and finished within three days during these long bus trips. The day we left Cambodia was quite possibly the worst travel day I’ve had since leaving home in August. We were trying to go from a remote island, Koh Rong Samloem to Ho Chi Minh City in Vietnam in one day. We left Lazy Beach (which I highly recommend, but it isn’t particularly cultural) by boat at 8:30am, took a two and a half hour soaking wet, rocky ride to Sihanoukville, hopped in a cab which drove us the four hours to Phnom Penh (for $50 total). During this time, we realized that there was only one little “VIP van” ($5 more per person than the bus) which we might be able to catch to get back to Vietnam in time. The van only had 9 seats and was leaving precisely at 3:30pm. We had entered our taxi at 11:45am and tried to secure seats on this van. It wasn’t possible to hold them, so we had our driver zipping all over the roads trying to get us there on time. There are no rules to the roads in Cambodia – cars pass each other constantly and often with something coming not far off in the distance, motorbikes travel both directions on both sides of the road, tuk-tuks also seem to go wherever they please. We saw two car accidents and a dog who had been hit during this hellish day of travel. Thankfully, our taxi driver helped us hold the VIP van an extra 15 minutes to get us on board and on our way to Vietnam on time, a 6 hour leg of our day. During our one stop for food from the van, we ended up at a restaurant I would never chance eating at on my own, but we were starving and had no other choice, so Lindsey and I split the safest thing I could think of – vegetarian stir-fried noodles. After we finally arrived to our Ho Chi Minh hotel, we settled in for bed. I woke up the next morning to find out Lindsey had been up all night with food poisoning, which she suspected had been the noodles, because that was pretty much all we ate the previous day. I, however, felt totally fine and thought perhaps my stomach had just gotten used to the food in Asia. Twenty four hours later, I said my goodbyes and sent my family off to Tokyo, then immediately started feeling a bit off. I had, at this point in Southeast Asia, had two other bedridden days, sick with some food-related ailment, and had a few questionable reactions to meals, but this was different. I actually woke myself up with vomit already in my mouth at 3am (I warned you about the graphic content! ), which pretty much confirmed that I too had the food poisoning Lindsey had also experienced. It was the cherry on top for my feelings about Cambodia – it is not a place I need to go back to for a long time, if ever. I still feel raw about Cambodia. I can’t imagine how it would feel to have my people creating mass graves of their own citizens in such recent years. I have no idea how difficult of a struggle it would be to grow up in a country which is trying to completely rebuild itself after such a horrific few years. I can’t imagine having people from other countries swoop in and take advantage of economic weakness so blatantly. And I can’t help but feel a bit guilty that I was lucky enough to be born into a civil and stable society. It is not fair. Facing it, even for a few days, was difficult but I am glad we went. It made me feel a hell of a lot more appreciative of what I was given just based on where I was born. It’s all relative, I know – but I think it’s also important to share the reality of the situation over here, at least from my experience. It’s something I won’t soon forget and I’ll be carrying with me as I move along. Wow, this is powerful! Everyone should read this.